There’s been a drastic fall-off in inbound FDI. 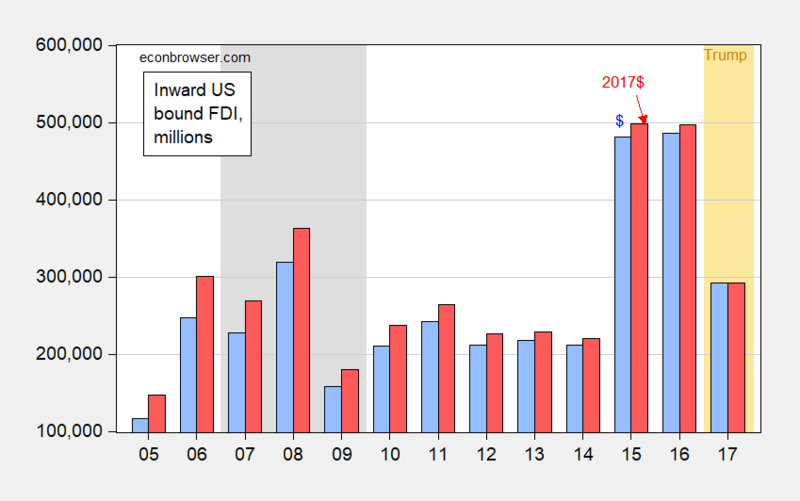 Figure 1: Inward US bound FDI, in millions $ (blue), 2017$ (red). NBER defined recession dates shaded gray. Trump administration denoted by orange shading. Deflation using CPI-U. Source: OECD, NBER, and author’s calculations. The decline in inbound FDI is remarkable given the buoyant stock markets around the world, and fast GDP growth globally. This entry was posted on November 12, 2018 by Menzie Chinn. It’s so funny that you put that up on the FDI, because I swear to God, that was one of the questions I was going to ask in the prior Japanese column post, what is the best source/link for “business fixed investment” (strictly for America)? ?—->> to track that number and “keep an eye on it”??? I know foreign direct investment is a different category, but they are kinda similar yeah?? I guess I can “google” the former question. Uncle Moses is so lazy though……. And it seems to have fallen even further in 2018, It is curious that this is going on, given that money is clearly flowing into the US in various ways as evidenced by the rising US dollar. You need nets, not grosses. And other flows of funds as well. OK but I presented net FDI yesterday – same story. Steve – note this started when PeakTrader flat out lied about FDI rising and Barkley corrected him. To which PeakTrader launched one of his patented insult parades. The presumption is that we’re witnessing classic crowding out, with government borrowing crowding out FDI and other private fixed investment (or at least reducing its growth rate), with the germane effect more on US real estate, I would think, than on inbound FDI. So we would expect to see increased foreign purchases of US government securities, increased net import trade receivables, increased outbound FDI, and decreased inbound FDI. Theory – great. But this is about actual data. Barkley and Menzie have been presenting the data whereas PeakDishonesty continues to lie about basic facts. Pgl, why don’t you quote or cite what I actually said. Rather than try to fool people with your fake news. Exactly what Barkley told us. And for that he got attacked by PeakTrader. Team Trump really hates facts. Off-topic I have Tim Wu’s book “The Attention Merchants”, which I am ashamed to say I have only read maybe 15 pages of. This interview had only been posted up recently, and Wu’s writing is quite good and he seems like a good person, so I thought I would share the video, and encourage people to read his writings/books NYT editorials, etc. And maybe if you’re not as supremely lazy as I am, not only could you say he’s a good writer, but you could tell people you had finished reading one or all of his books. What’s remarkable is the 2-year increase in FDI – not the return to normal. I was going to make the same comment that Bob did. Thanks for the additional insights. If I were to look at that graph without a title, I’d ask why 2015-16 were so unusual, not why 2017 seemed normal. I noted that the FTSE 500 seemed depressed in 2015-16 and then recovered in 2017. https://money.cnn.com/data/world_markets/ftse100/. Likewise, the DAX: https://money.cnn.com/data/world_markets/dax/ Likewise, the NIKKEI 225. https://money.cnn.com/data/world_markets/nikkei225/. So, is the assertion that the rise of the world stock markets equates with the rise of FDI in the U.S. correct… or is the opposite true? Same point Bob Flood made but then see Menzie’s reply. I’m still inclined to think that the uncertainty of the EU situation in 2015-16 was more a driver of an unusual influx of investment to the U.S. than the subsequent decline after the European situation settled down. On October 1, Menzie had a post “mini-recession” or the like during 2015-16, http://econbrowser.com/archives/2018/10/the-mini-recession-of-2015-16. But that leads me to think that it wasn’t the U.S. economy going great guns that lured investment as much as trouble overseas. As usual you read data in a way that suits you. A different read is, now that the FDI level has returned to a more normal level, it may be the right time to consider the reasons for for the abnormal rise in 2015 and 2016. Gee Ed. You are following the lead of Bob and Bruce. And notice something Ed – Menzie addressed Bob’s comment. One other thought about the 2015-16 period. Wasn’t that when the EU was going through some turmoil regarding an anticipated Brexit as well as problems in Greece https://money.cnn.com/2015/06/29/investing/greece-default-bigger-than-argentina/index.html ? Without some detail about whence the FDI, I’m only speculating that investment might have been seeking a “safe haven” in anticipation of an upheaval (which really didn’t happen and might account for a more normal 2017-18 FDI in the U.S.). I know it is tempting to point toward Trump for every blip (or assumed blip) in the economy, but I don’t think that is a reasonable presumption this time. It would seem that it might be important to know where the F part is from. Europe, Middle East, or the Rest of Asia to name the likely suspects, and if one of those area could account for the changes over the three years. Ed, I agree that the source of the FDI is valuable information. In a previous comment, I pointed out that the British, German, and Japanese stock markets had fallen in 2015-16 while FDI in the U.S. increased and then speculated that EU problems in 2015-16 might have been part of the problem. FDI is more that. Dig deeper as http://www.bea.gov provides more and better data. http://www.bea.gov presents certain details if one is willing to dig deep into what they offer re International Transactions. Good to know that no one on the right pointed toward Obama for every blip (or assumed blip) in the economy, c. 2009-2017. Must have ben crazy libs who were apoplectic about deficits and rising debt as well as the steady decreases in unemployment or how socialism was adversely the DJIA. Thanks for the reminder. Seems pretty obvious. It’s a HIATUS! FDI in the U.S. was high in 2015 and 2016, because of restructuring. China reduced FDI in the U.S. by 30% in 2017. Investors were waiting till tax reform settles. The opposite of what you said yesterday. AKA you lied. And when Barkley corrected your lie you childishly attacked hi. You owe Barkley an apology but we know you are not man enough to give one. Pgl, after you read the entire article, you can apologize for being wrong, again (and again…). At least, show a little competence. I did read it. Did you? If so, you know you are misrepresenting even your own links. But hey – you misrepresent even basic facts! Hey PeakyBoo – this is how real people do things. Someone should fix your Russian bot programming as it is very defective. Agreed. The increase coincides with the collapse in commodity prices, particularly oil, in 2014, early 2015. That said, MC’s stylized facts of investment flows, stock market and currency values are widely accepted. Interesting vote of confidence in the US economy while being managed by a foreign born Muslim terrorist….. If the greatest president of all time somehow fails, I suppose one can easily blame the Deep State.